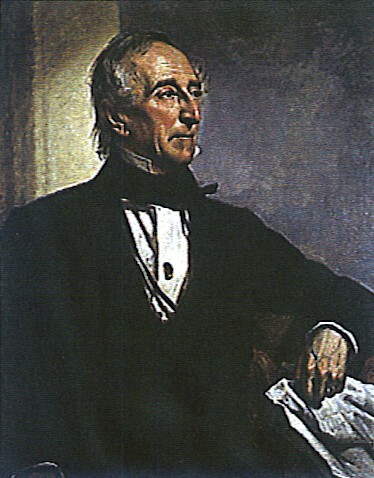 The tenth president of the U.S.
First, let’s review the things you do know about John Tyler. In the election of 1840, he was the running mate of presidential candidate William Henry Harrison. Their memorable campaign slogan, of course, was “Tippecanoe and Tyler too”. Harrison died a month after his inauguration, and because the Constitution only said that the duties of the presidency “devolve” to the vice-president, there was a debate over whether Tyler should be acting president or actual president. Tyler won that argument, and had himself inaugurated as the tenth President of the United States. Because of the way he attained the office, Tyler was referred to as “His Accidency” by his detractors, of which there were many. He had initially been a Jacksonian Democrat, but wore out his welcome with them. He had run for vice-president as a Whig, but while he was president, the Whigs expelled Tyler from their party because he kept vetoing their pet projects. In fact, in 1841 his entire cabinet (except Daniel Webster) resigned in disgust. Another thing you probably remember about President Tyler is that his most notable achievement was the annexation of Texas, a bill that was signed into law three days before the end of his term. 1) He had three first ladies. His first wife, Letitia Christian Tyler, died in September, 1842. Tyler asked his daughter-in-law, Priscilla Cooper Tyler, to assume the ceremonial duties of the first lady. She served in that capacity until June of 1844, when Tyler married Julia Gardiner. There were a lot of eyebrows raised over that relationship, because he was 54 and she was 24 when they married. Woo-hoo. 3) John Tyler and his father (also John Tyler) both served as governor of Virginia. Dad, who was a friend of Thomas Jefferson, held office from 1808-1811. Our guy was governor from 1825-1827. He also was a congressman and a senator from Virginia. 4) Tyler was the first president born after the adoption of the U.S. Constitution, and was the only president to renounce it. In 1861 he sided with the Confederacy and was elected to its House of Representatives, but he died before he could take office. 5) He was the only president to die outside the United States; Tyler died in Richmond, Virginia, in January of 1862. You are now reasonably well equipped in case you’re ever on a game show and the category is “John Tyler”. Good luck with that! This entry was posted in History and tagged John Tyler. Bookmark the permalink. If I’m ever on Who Wants to Be a Millionaire, you will be my phone-a-friend. I’m flattered that you thought I knew anything at all about Tyler, except how to spell his name. And why exactly is Richmond, VA outside the United States? Were the Confederate States technically not still part of the U.S.? Good question, Brian — it goes right to the central issue in the War Between the States. From the perspective of the Union, Virginia (and the other Confederate states) were indeed still part of the United States. By seceding, though, the southern states had declared themselves independent of the U.S. Since Tyler died in the capital of the Confederacy during the Civil War, I think it’s fair to say that at that time he was outside the United States.